1810 House volunteers Camden Noel, Jocelyn Hill (standing), Finley Noel and Grey Kegley help prepare the home for a pioneer Christmas. Portsmouth’s historic 1810 House will be opening its doors and inviting the community in for the Annual 1810 House Christmas Open House. 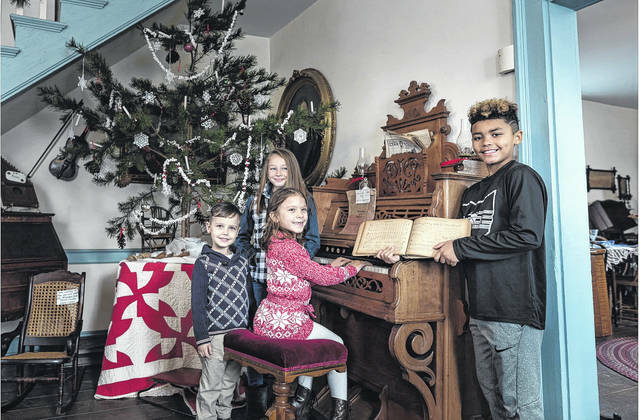 Community members are invited to come see the house decorated for Christmas, enjoy some live music, caroling, hot cider and cookies while touring the piece of Portsmouth’s past. The event will be from 2-4 p.m. on Sunday, Dec. 3. Lindsey Kegley with the Scioto County Historical Society, who keeps and maintains the house, explained that the theme for this year will be a pioneer Christmas. Live music will include period music. There is no cost to attend the event; however, donations are always accepted. Donations help cover the expense of maintaining the house. The 1810 House is open Sundays from May through the end of the Christmas season. Private and group tours are available at no cost. The house can also be used for meetings and luncheons. Kegley explained that the 1810 House, named after the year it was built was the home of the Kinney Family, who was a prominent episcopal family in Portsmouth. The patriarch of the family was a tanner by trade. He and his wife raised 12 children during the 1800s, all of which lived to adulthood. The Kinney Family home was passed down through the generations until 1947 when the last family member gave up residence in the 1810 House. Since that time, the home has been a relic of Portsmouth past that stands as a monument to the history of the area. Over the years, the house has underwent various remodels and even additions. The house was first added onto, gaining a kitchen and bedroom, in 1812, just two years after it was constructed. Even the changes represent the different time periods through which the house has survived. “You can see the changes over the period of years,” Kegley commented. The 1810 House is maintained through an annual membership drive as well as donations; however, Kegley explained that the keepers of the home are looking at new ways to raise funding while also drawing people into the home and helping people to see the significance of the many items contained within its walls. Events for the coming year are likely to focus on historical significance, whether focusing on information relevant to the time period, to Portsmouth or to the home specifically. Each will help bring the history to life and help those visiting the home understand more about life in the 1800s. “Look forward to new things coming from the 1810 House,” Kegley concluded. The 1810 House is located at 1926 Waller Street in Portsmouth and features red brick and white columns. For more information, visit www.1810house.org. Reach Nikki Blankenship at 740-353-31010 ext. 1931.